1 Unlock cam (1) and remove ammunition box tray assembly (2) from ammunition bracket (3). 2 Clamp machine gun cradle (4) in vise with case (5) facing to the front. Case is under spring tension. To avoid injury to personnel, use care when removing case. 3 Loosen but do not remove hexagon head capscrew (6). 4 Place socket and drive socket handle on hexagon portion of case (5). 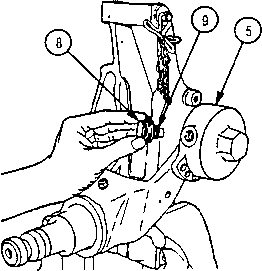 Hold handle to counterbalance spring tension. Remove hexagon head capscrew (6) and lockwasher (7). Discard lockwasher. 5 Allow socket handle to rotate downward to relieve spring tension. Remove socket and drive socket handle. 6 Remove equilibrator stud (8) and lockwasher (9) from case (5) and remove case. Discard lockwasher. Remove machine gun cradle from vise. 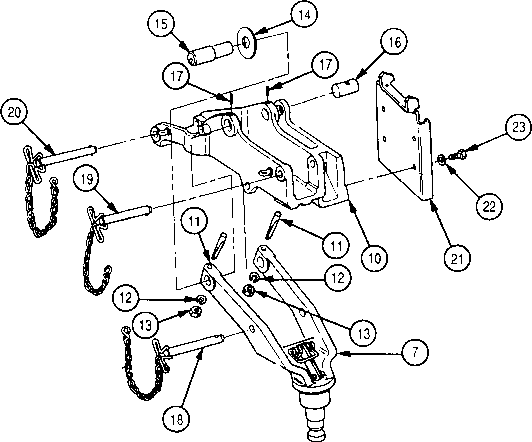 8 Remove four hexagon head screws (13), four lockwashers (14), and ammunition bracket (3) from machine gun cradle (4). Discard lockwashers. 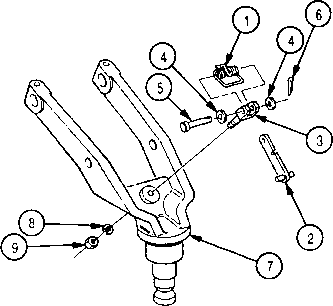 9 Remove three quick release pins (15, 16, and 17). 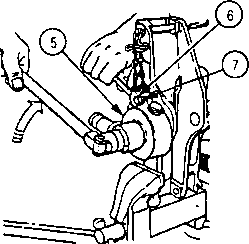 10 Remove two wicks (18), two hexagon plain nuts (19), two lockwashers (20), and two threaded tapered pins (21). 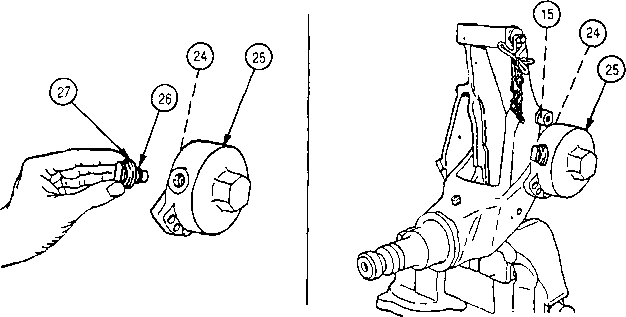 Remove headless straight pin (22) and headless grooved pin (12) from machine gun cradle (4). Separate mount pintle (23) from machine gun cradle (4). Discard lockwashers. 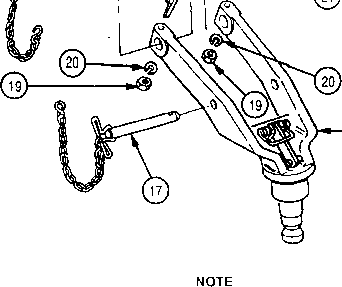 Remove hexagon plain nut (24), lockwasher (25), and rod end clevis (26) with attached parts from mount pintle (23). Discard lockwasher. 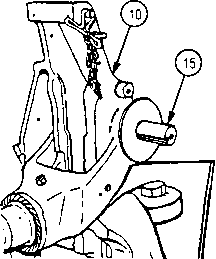 Remove cotter pin (27) from headed straight pin (28), and remove headed straight pin, two flat washers (29), machine gun bar (30), and torsion helical spring (31) from rod end clevis (26). 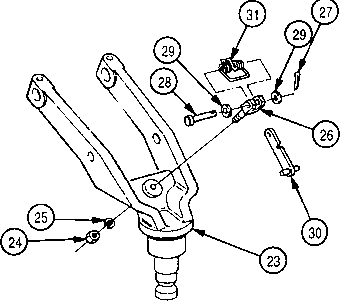 Discard cotter pin. 1 Inspect for broken, damaged, or missing parts. 2 If mount pintle is broken or damaged, repair is by replacement of next higher assembly. 3 Touch up bright metal surfaces with olive drab enamel paint (item 3, appx E). 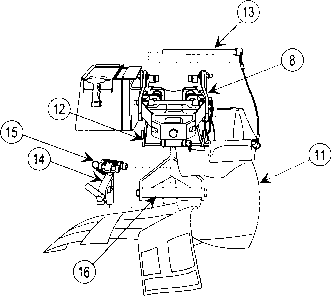 4 Repair is by replacement of authorized parts (appx C). 1 Align torsion helical spring (1) and machine gun bar (2) with rod end clevis (3) and secure with two flat washers (4), headed straight pin (5), and new cotter pin (6). 2 Place rod end clevis (3) with attached parts in mount pintle (7) and secure with new lockwasher (8) and hexagon plain nut (9). 3 Align mount pintle (7) with machine gun cradle (10) and secure with two threaded tapered pins (11), two new lockwashers (12), and two hexagon plain nuts (13). Install flat washer (14) onto headless grooved pin (15). Install headless grooved pin (15) with flat washer (14) and headless straight pin (16), and secure with two wicks (17). 4 Install three quick release pins (18,19, and 20). 5 Place ammunition bracket (21) on machine gun cradle (10) and secure with four new lockwashers (22) and four hexagon head screws (23). 6 Clamp machine gun cradle (10) in vise with headless grooved pin (15) facing to the front. 7 Install torsion spiral spring (24) into case (25). Align hole in spring end with equilibrator stud hole in case. Secure with new lockwasher (26) and equilibrator stud (27). 8 Align torsion spiral spring (24) tang with slot on headless grooved pin (15) and install torsion helical spring (24) and case (25) on headless grooved pin (15). Place socket and drive socket handle on case (25) and apply pressure to case until adjusting holes in case and machine gun cradle (10) align.